We are thrilled to be included in the 2019 Taiwan International Percussion Convention! This festival brings together some of the biggest names in percussion from around the world to perform an amazing variety of music. Read more below! We can’t wait! 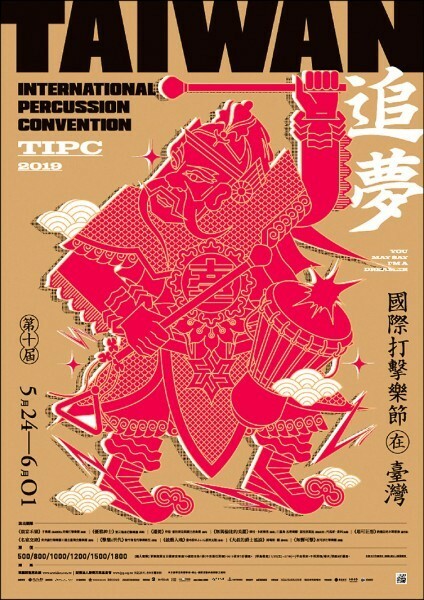 TAIPEI (Taiwan News) – The 10th edition of the Taiwan International Percussion Convention (TIPC) will take place from May 24 through Jun. 1 and include a total of 15 performances at major art venues across the island. The shows will be staged at National Concert Hall in Taipei, National Taichung Theater, Tainan Municipal Cultural Center, and Dadong Arts Center in Kaohsiung. Since it was established in 1993, the event has grown to become a world-class music fiesta, and was hailed by French percussion ensemble Les Percussions de Strasbourg as “the Utopia in the world of music,” according to event sponsor Ju Percussion Group (朱宗慶打擊樂團). “Pursue your dreams” and “internationalization at home” are the festival’s two major themes. The poster for the event features the red “door god” from Chinese folk religions, which symbolizes the protection of traditions as the TIPC enters its 10th edition. This year’s lineup includes 70 top-notch percussionists from 12 countries, namely: the Netherlands, Germany, France, Bulgaria, Austria, the U.S., South Africa, Mexico, Malaysia, Japan, South Korea, and Taiwan. The convention will kick off with a concert by Ju Percussion Group and National Taiwan Symphony Orchestra on May 24. A cohort of young Taiwanese performers, the youngest of whom is 9-year-old, will treat audiences to a special show. Some of the performance highlights include Grammy winner Third Coast Percussion, and Marimba Nadaypa, Vassilena Serafimaova, Thomas Enhco, Murat Coskun, Dizu Plaatijies & Ibuyambo Percussion Ensemble, Thomas Lang, as well as Percossa. Visit the official website of TIPC for more information.